In 2000 I was invited to take part in a workshop to investigate whether documentary films could be the starting point for something involving the new media: a website, a CD-ROM or something interactive. The initiative came from the Fund for Cultural Broadcasting Productions (Stifo) and the Sandberg Institute. During the course of one year, filmmakers, graphic designers and web designers would attend lectures by experts and set up joint projects. This would eventually lead to my own website about the island of Tiengemeten, in collaboration with Fred Inklaar and Tigran Spaan. We first met on 30 May, 2000, and would continue in September. New media were actually pretty new back then. I thought it would be useful if I were to try out some things independently from the workshop. Sometime during that summer I started to design my own website. In Frontpage, of course, in those days the most commonly used program for making your own website. The oldest file I can still find on my computer today is dated 9 August, 2000, 12:40 hours. It’s a background design for the homepage: blades of grass that I had simply drawn with the mouse. You stuck the bitmap picture as a background behind your text and you could choose how to repeat the picture until you had filled the screen. I called the site Digna Sinke’s Secret Archive. There was a Dutch and an English version from the start. The starting point was the organization of my records in the fifteen cabinets in my basement which I had labelled with letters (high cabinets) and Roman numerals (low cabinets). And of course I keep a database of all that is in there. But the time of innocent simplicity is far behind us now. These days a website has to be compatible with all platforms and meet all kinds of rather complicated requirements if you want to be able to be found through Google. A kind of format has now been designed in WordPress which I have to fill out myself, of course. 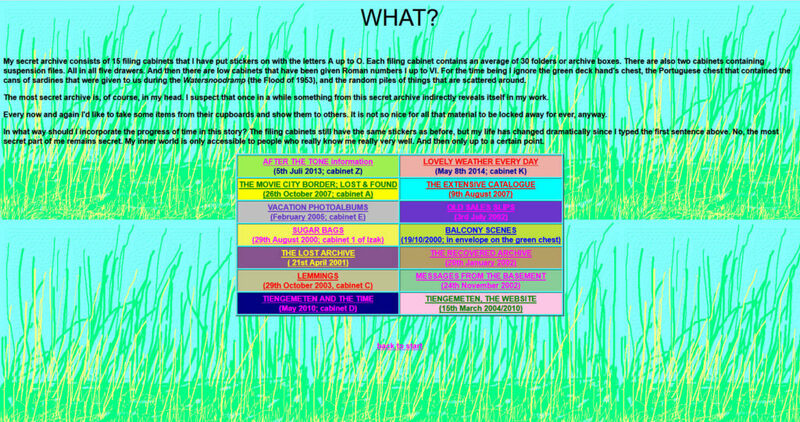 Most of what used to be on the site can still be found on it today, but now neatly accessible through a menu. In fact, there is a lot more on it, and some references to my cabinets are still there, but the backgrounds were no longer drawn by mouse and the colourful boxes have also disappeared. The other day someone told me he had tried to find the old-style website, he had liked it, but it was gone. That is why I wrote this. 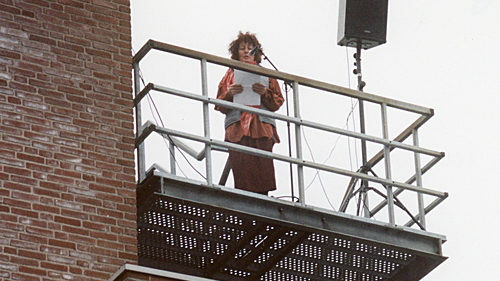 On Sunday 15th October 2000 the manifestation BALCONY SCENES ( SPEECH AMONG THE FLOWERPOTS) took place in the town of Apeldoorn, Sjaak Langenberg’s project. From eight different balconies Hans Aarsman, Kader Abdolah, Vincent Bijlo, Wim Cuyvers, Piet Meeuse, Hans Venhuizen, Bart Vos and I (Digna Sinke) delivered a speech. I got to stand on the balcony of the Vosselmanstraat police station. It was a special occasion, not in the least because a large group of people became a curious company of city dwellers. It was a grey day in October. At the end of the afternoon it even began to drizzle a bit. But there was an enchanting variety in balconies, in speakers and in what was said. *I wrote this text in 2000. Of the buildings in Apeldoorn I described not many are left today. If I had too much time, I should walk through the entire town with my all my local sugar packets to see which buildings are still standing. This year’s Groeneveld Prize has been be awarded to filmmaker Digna Sinke, born in Zeeland province, but long since based in Amsterdam. The judges’ report praises Digna for the way she draws attention in her work, now consisting of 25 films made over a period of 45 years, to the meaning of the natural landscape. 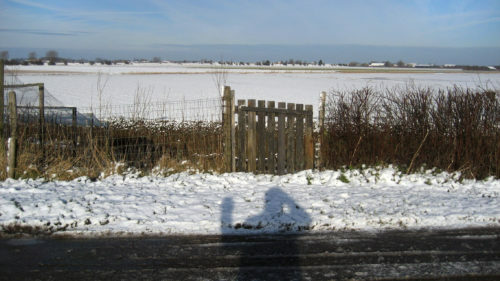 Not only in her documentaries dealing with the development of the natural landscape – such as her film about the transformation of agricultural land to a new natural environment on the island of Tiengemeten, and her recent film Below the Surface about the plan to give Zeeland’s Hedwigepolder back to the sea – but also in her other films, the landscape often plays a special part. The award will be presented at Castle Groeneveld in Baarn on 4 November 2016. The award includes a prize of € 5,000. Since 2000 the Groeneveld Prize has been awarded annually to an individual or organisation that has made a significant contribution to the debate about the green environment and has done so in an original, critical manner.